Did you know approximately 48 million Americans report some sort of hearing loss? If you have noticed a change in your hearing, you are not alone. Are you trying to decide on the best hearing aid for you? Take a look at our reviews of some of the best hearing aids currently on the market. In the world of hearing healthcare, you can easily get overwhelmed on what hearing aid brand to choose from and who to buy it from. There are also a few misconceptions about hearing aids making your decision more difficult. We decided to deliver the best hearing aids right here. Please keep in mind that before making a decision you consult a professional to make sure you are a candidate for the hearing aids you choose. This specific hearing aid is made out of titanium hence the name. This allows for the hearing aid to be 30% thinner and smaller than an acrylic hearing aid. This is a very discrete hearing aid. It’s considered the best Invisible In Cancel hearing aid on the market. It’s also the smallest hearing aid in the Phonak family! This specific hearing aid isn’t suited for extremely severe cases of hearing loss and it requires a deep earmold impression. The Virto B-Titanium was named a CES 2019 Innovation Award Honoree in the 3D Printing category. The CES Innovation Awards are the world’s leading consumer technology awards. This hearing aid has long-lasting lithium-ion rechargeable batteries. It also has the capability of streaming from Android devices which is a plus if you have android. It has the best smartphone app in the entire industry. This hearing aid allows you to make a ton of adjustments to your program settings and allows you to receive remote adjustments from your hearing care professional if you choose. 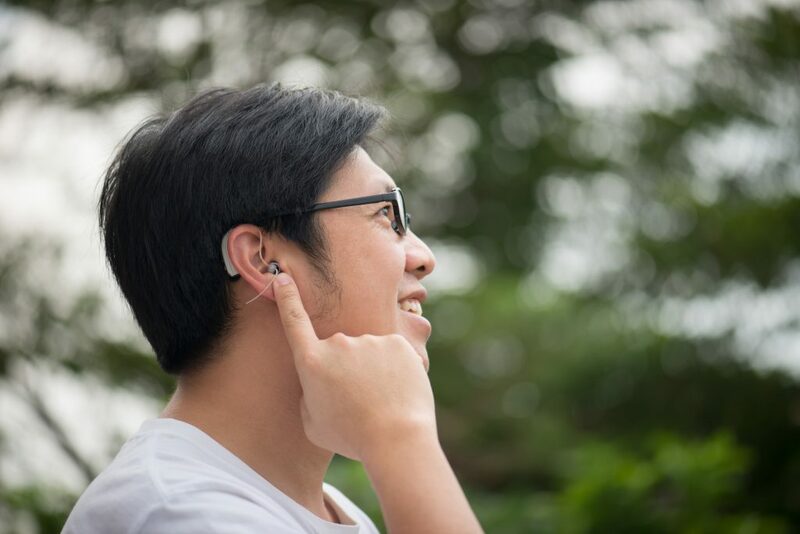 This hearing aid uses onboard sensors to track body movement and social interaction. Due to this technology, it has Artificial Intelligence right in its name. It also has the capability of working with remote accessories like a remote microphone and TV streamer which will improve your listening experience. Opticon is the leading hearing aid manufacturer that is known for connecting mobile phones and the internet. It has earned an A+ rating from the Better Business Bureau. This allows streaming audio from movies, music, and TV shows directly into your hearing aid. The OPN model has been a very popular hearing aid since 2016. The OPN Sound Navigator allows you to hear speech from all directions while it suppresses background noise. This feature along with decreased listening effort and good sound quality makes this one of the best hearing aids that money can buy. Another unique feature the OPN offers is that you can listen to multiple speakers. Widex is known in the community as the brand that helps provide the clearest and highest quality sounds for customers. They strive to create high-quality technology with precision tuning and very rigorous testing. Widex aids are known for helping hear the intended sound and reduce the noise at the same time. One of the most common issues hearing aids have is the aid amplifying the background noise instead of the intended sound which can be frustrating. Another feature Widex hearing aids are known for is suppressing wind noise which is perfect for the outdoor enthusiast. The evoke model has machine learning features. This model can learn your preferences by giving you the ability to make A/B comparisons in a real listening environment. You just have to tell the App if you prefer Sound A or Sound B and it keeps track of the data. It takes this data and improves how you hear and over time is able to learn your preferences. This hearing aid is unique because it has FLEX: UPGRADE which lets you purchase a lower level of technology and at any later date you can choose to upgrade to a higher level of technology. The technology inside the devices upgrade and you don’t have to physically change out your device. This is a huge plus because you decide when you want to upgrade it can be at any time even years later. This hearing aid is the closest one that you will find to being an all-in-one device because it does everything. It’s the only device that can stream directly from either Android AND iOS devices without any extra accessories. This hearing aid is Roger-Ready which means that your hearing care provider is able to do a firmware update to make the internal Roger Receiver active to use any of the Phonak Roger FM accessories. Feeling More Confident in Your Next Hearing Aid Choice? If you were feeling a bit overwhelmed before this list of the best hearing aids should help ease that feeling. Hearing helps us lead our everyday lives and empowers us. We understand that it also helps us stay connected to the outside world and keeps us safe by warning us of potential danger. Choosing the right hearing aid is a very important decision when suffering from hearing loss. Is this your first set of hearing aids you will be purchasing? Check out our article about how hearing aids work and how they help you hear.